Anxiety – that creeping feeling of panic, worry, fear and dread. Anxiety today holds a strong grip over a very large population. In fact, Anxiety Centre reports that approximately 30% of the adult population between the ages of 18 and 54 are affected by anxiety disorders in the US alone (1). At the workplace and in school, anxiety has been reported in 41% of employees from a range of industries, and more than half of college students seek help for anxiety issues. Anxiety has advanced to become the leading mental health issue in North America. It’s estimated that individuals with anxiety disorder are 3-5 times more likely to visit the doctor and 6 times more likely to be hospitalized for psychiatric disorders than non-sufferers. Everywhere you look these days, people seem stressed out. Many reach a breaking point and sink into depression – a mental health issue unknown a few generations ago, yet so common today. Why is that? Perhaps people today are more willing to recognize and admit to their stress and depression, something not common 50 or 100 years ago. Then again, maybe not. Looking at surveys from the 1970s to 2010s, it actually looks like fewer people are admitting to being stressed and depressed, as more recognize they have psychosomatic symptoms. So it seems that there is a true increase in anxiety, stress and depression today, and not just a decline in stigma. There are probably other reasons. As tempting as it might be to mention technology, there is just no documented proof or research to support this – the increase in anxiety and depression was in place long before cell phones and Facebook. So, how to fight it? Anxiety is treated with medications and counselling. The pharmaceutical companies seem to thrive on the anxiety of people, with reported 65% of North Americans taking prescription medications daily and 43% taking mood altering prescriptions regularly. However, medication is not the only way. There are many holistic approaches that have proven successful in dealing with anxiety, like meditation, yoga, massage, regular exercise, or simply laughing a lot. Last time we presented an ancient Japanese Art of releasing tensions, actively practiced in the USA. Another new approach in releasing anxiety is music therapy. Our story today comes from neuroscientists in the UK, who declared that they have found the perfect song for people who suffer from anxiety. They report that this song has the ability to reduce anxiety by 65% by simply listening to it. According to Dr. David Lewis-Hodgson of Mindlab International, this song managed to induce a greater state of relaxation in the listener than any other music tested to date. 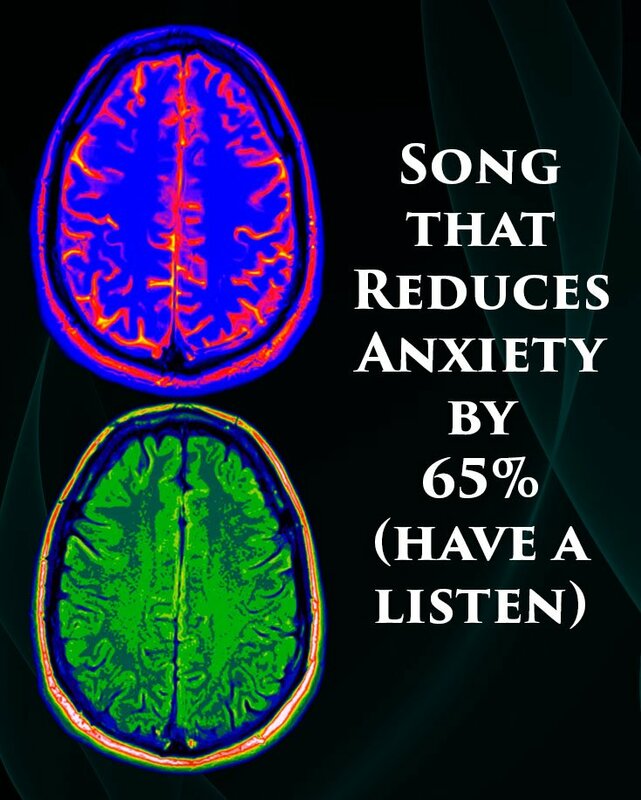 Their tests show that listening to this song results in a staggering 65% reduction in the participants’ overall anxiety and a 35% reduction in their usual psychological resting states. The name of the song is Weightless and is created by Marconi Union. It’s also not a coincidence that this song is the most relaxing of them all. Marconi Union created this song in collaboration with sound therapists. It has been purposefully designed to slow down heart rate, reduce blood pressure and lower levels of stress.